Move over Maison Ikkoku. For a long time, the café-cocktail bar represented all that was cool and good along quiet Kandahar Street – but no more, thanks to Cicheti, an Italian-inspired restaurant dishing out good food and cool vibes in equal measure. 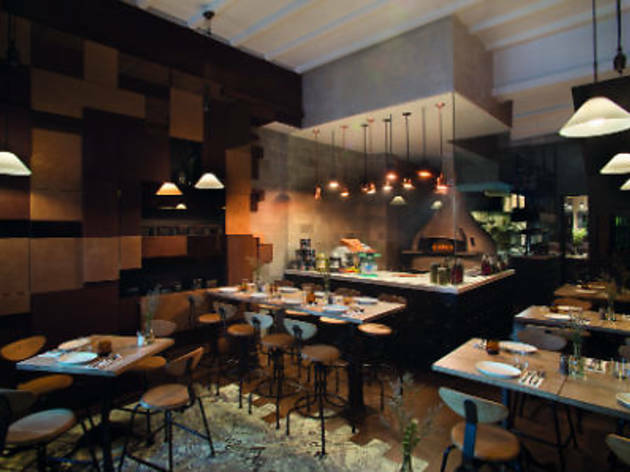 An independent venture by chef-owner Yew Aun Lim and his cousin Liling Ong (both of whom have remained well under the radar until now) – which can often be a recipe for disaster – Cicheti seems to be as well thought-out as they come. It’s flashy, yes – attracting a well-heeled crowd even on a Tuesday – with bespoke details, custom-made furniture by creative consultant Chun Y. Gee and antique cameras to up the hip quotient, but the atmosphere smacks of convivial warmth rather than attitude. And though its name comes from the small snacks native to Venice’s wine bars, it’s hard to pigeonhole Cicheti’s food; Yew’s cooking covers a multitude of influences from all over Italy. The menu is spearheaded by a selection of ten-inch Neapolitanstyle pizzas ($17-$19), all painstakingly rolled out by Yew behind a glass-encased kitchen, and nicely-charred in a two-ton wood-fired oven imported from Italy. The Bismark ($19) deploys housemade tomato sauce, mozzarella and parmesan cheese for a winning combo with ham, bacon, mushrooms and a runny egg yolk that adds a creamy lusciousness to the bread. Pastas – mostly handmade – are scrumptious too; we liked the spaghetti alle vongole and pappardelle ragu (both $23), the latter a fresh, less gamey version featuring perfectly cooked pasta and tender chunks of slow braised lamb shoulder. 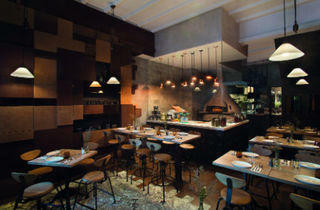 In between, Cicheti’s small plates should keep you busy. Try the polpette di carne grana ($11) – firm, flavourful beef meatballs with a nice bite that are pan-seared and left to braise in a slow-cooked tomato sauce. And definitely don’t miss the cioppino ($27), a seafood stew that distills the briny essence of the sea. There’s a mix of fish, prawns, squid and clams in it, but what floored us was the complexity of the broth that had us spooning up every last smoky, slightly sweet drop. We’re told Yew handpicks the seafood from the market every morning, so portions are limited – there’s even less if he deems the catch unworthy. Yew’s meticulousness with provenance is also evident in the branzino sotto sale ($35), a whole sea bass crusted with salt and given a blast in the oven. At that price, it’s a steal and feeds two comfortably. For desserts, the airy tiramisu and grappa-flavoured granita with herb jelly ($12.50) are both excellent, light choices to end your meal with, but by far the most impressive thing about Cicheti is that it’s one of those rare places you can recommend to friends, safe in the knowledge that whichever direction they take – a dinner with colleagues, a romantic date or a weekday lunch – they’re liable to be in good hands. It all adds up to a top quality restaurant in an area crying out for one – expect even more buzz when their second-floor bar opens up, which will feature grappa-driven cocktails and a mesmerising cloud ‘chandelier’ of more than 2,000 recycled light bulbs. We can’t wait. 52 Kandahar St (www.cicheti.com, 6292 5012). Mon-Fri noon-3pm, 6.30pm-11pm; Sat 6.30pm-11pm.